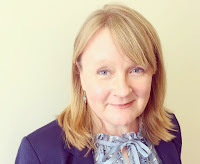 Sibel Kusimba's IMTFI-funded project on social networks around mobile money cited by Susan Johnson in this important blogpost with Next Billion on the complexity of gender dynamics behind MM: Why and how is mobile money ACTUALLY narrowing the gender gap? In spite of the rise of mobile money in sub-Saharan Africa, just 12 percent of people age 15 and older now have a mobile account, compared with 29 percent who have an account at a formal institution. But the gender gap for mobile money accounts is lower than that for formal accounts; women have 7.6 percent less access than men to formal accounts (32.7 percent vs. 25.1 percent) but just 2.5 percent less access to mobile money (12.8 percent vs. 10.3 percent). More detailed regression findings for Kenya in particular show that gender is not a significant variable in determining access to mobile money accounts in Kenya – though it is for formal financial institution accounts. This is surprising. For information and communication technologies generally, the evidence suggests that gender gaps are significant, with the World Bank reporting that women are 50 percent less likely than men to use the internet in Africa and significantly less likely to use cell phones. So the question is: Why is mobile money different? The “go to” answer for this (from groups like the Better than Cash Alliance) is that digital is solving the constraints of formal financial inclusion. Its advantages include: the proximity of agents to women whose domestic constraints render them less mobile than men; the fact that mobile money accommodates small payments with low transaction costs in ways that formal accounts do not; the fact that the technology enables money to be kept securely on the SIM card, and that digital offers a level of privacy and confidentiality that having to travel and walk into a bank does not. However, if we are to really mind the gender gap we can’t simply presume that mobile money is succeeding by overcoming these rather conventional assumptions about the constraints to women’s financial inclusion. Indeed, from my research, these assumptions seem at best a partial explanation for why the mobile money gender gap is narrower. To fully explain the gap, we must ask how men and women are using mobile money in these contexts and what this means for analysis and policymaking. One obvious use is very straightforward but surprisingly not often discussed in terms of gender dynamics. The “send money home” marketing effort of M-Pesa shows us a clear gendered story of men – in this case probably well-educated, young, urban, employed men – sending funds to their rurally based mothers. A similar gendered urban-rural story of migrant husbands was detailed by Olga Morawczynski in her early ethnographic research on M-Pesa’s use. This gives us the first dimension of our answer: Mobile money is a network technology that connects people and fits into a pattern of gender relations in which urban-based men earn and remit to rurally based women. So far, so apparently straightforward. But the key point we must take from this is that “normal” financial services are not networked and hence do not have an impact on adoption by others – it is the networked nature of mobile money in the context of remittances that means women get included. What’s more, it’s clear that mobile money is now far more than an instrument to enable urban-rural remittances; it has a much wider range of uses for gifts and interpersonal transfers of many types. Sibel Kusimba’s detailed ethnographic analysis of the social networks around mobile money among the Bukusu in western Kenya gives us further insight. Doing well means successfully accessing extended family resources and these networks are mostly based in flows within sibling, mother and cousin relationships. Kusimba shows that women – especially mothers – are central to these networks. The contributions from men more often come from brothers and mothers’ brothers than fathers; that is, maternal kin. This is not to say that ties through patrilineal kin are not also important and institutionalized – but it is to point out that women are critical lynchpins to many of these networks. As Kusimba puts it (page 273), “In a context of rapid social change … the hearthhold based around a woman, her relatives and her children is becoming a basis for lifelong bonds of support.” These exchanges of funds also serve to confirm the strength of relationships, transmitting affection and strengthening emotional ties (see also Johnson and Krijtenburg, 2014). Moreover, since 33 percent of households in Kenya are de jure female headed, mobilising resources for their own children through these ties to male kin is vital to their survival. Even small gifts enable investment in this woman-centric “hearthhold” over time without “disrupting widely shared ideals of patrilineal solidarity and household autonomy,” she says. These patterns are supported by further (as yet unpublished) analysis that we have undertaken of the financial diaries dataset drawn from five locations across Kenya. This analysis involved nearly 800 low-income individuals over a period of 11 months, with data on resources received in cash, including through mobile money, and in the form of in-kind goods. We found that having a mobile phone increased the value of resources received by women through mobile money, when compared to women without a mobile phone, though surprisingly the same effect was not evident for men. Women’s receipts were higher in total across all types of resources received and through the mobile money channel and also when they were married and household heads. Women received more via mobile money when they had more women in their network of close family sending them funds, meaning women were sending higher amounts than men, which suggests a strong woman-to-woman dimension among close family (parents, spouses, children). Yet men also gave more when they had more women in their close family network. However, in the wider network of family (including siblings, cousins, aunts/uncles), both men and women received higher amounts when they had more men in these networks – further supporting Kusimba’s finding about the importance of male relatives. Moreover, we found that when both men and women gave to women in both their closer and wider family networks, this then raised the amounts they in turn received, demonstrating a reciprocal dynamic at work. This evidence shows the complex gendered dynamics of finance and its networked characteristics. It is not yet possible to tell a simple story from these findings, but they tell us that in order to understand mobile money adoption, we need to recognise and understand these dynamics – and to move beyond the conventional axioms regarding gendered constraints to financial access. The implications for financial inclusion analysis, policy and product design are significant. By understanding these networks, we’ll begin to understand what both men and women actually do with their money, how it connects them to others and what financial services can do to facilitate this. A team of researchers from University of Bath and University of Antwerp with support from FSD Kenya. Susan Johnson is a senior lecturer at the Centre for Development Studies at the University of Bath. Photo: M-Pesa’s “Send Money Home” ad, courtesy of Safaricom. Read Sibel Kusimba's recently released final report (Sept 2017), "Dynamic Networks of Mobile Money among Unbanked Women in Western Kenya"
"Hearthholds of mobile money in western Kenya" is now available for free download at Economic Anthropology until October 20, 2017. It has been three years since the Central Bank of Nigeria introduced the Cashless Nigeria Policy. Its aim was to encourage the use of electronic systems for all monetary transactions. The policy has yielded benefits: it makes many transactions simpler and safer for more people. But there has been an increase in fraud in the banking and payment systems. These crimes are carried out using the information and communications technology that has flourished in Nigeria since the early 2000s. A 2013 report by the Nigerian Deposit Insurance Corporation identified 14 types of electronic fraud (e-fraud). Automated teller machine (ATM) fraud was in prime position. It accounted for just under 10% of the total value of funds lost to e-fraud and 46.3% of the reported number of cases. 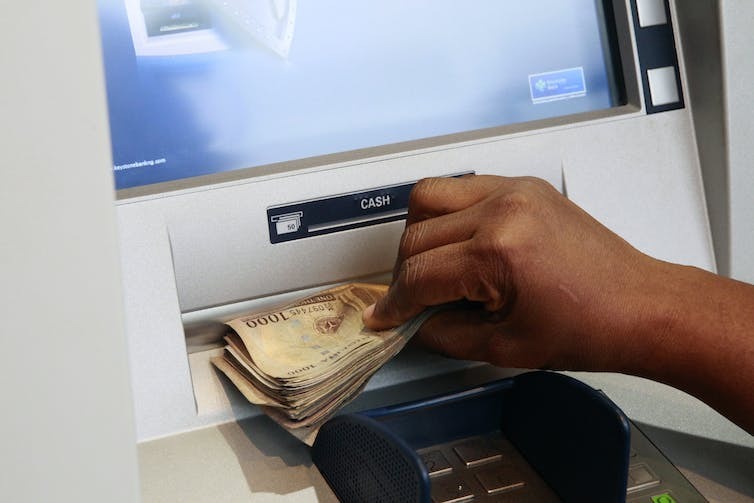 The agency’s 2015 report points to an increase in the incidence of ATM fraud in Nigeria. Despite the apparent importance of e-fraud, little scholarly attention has been paid to understanding how it affects the functioning of the financial system and its impact on victims. That’s why my colleagues and I carried out a study to examine the experiences of ATM fraud victims in south-west Nigeria. We focused on what made a person more likely to be a victim and on the fraudsters’ tactics. We found that a number of factors predisposed people to being victims of fraud. These include illiteracy, health problems and issues of vulnerability. I was given an ATM card and nobody told me how to use it. Outside the bank I gave it to a young man at the ATM to help me withdraw cash. He did it and returned my card to me. After a few days I noticed money had left my account, which I promptly reported to my bank. At the bank I was told that the young man had swapped my card. Our study also showed that close family members sometimes exploit people’s trust to defraud them. One middle-aged man gave his son his ATM card to draw N5,000 (USD $31.25) ahead of returning to school. He later discovered that his son had instead drawn N10,000 (USD $62.50). “If my son could do that to me while I was trying to help him, who can one trust?” he lamented. When people are ill, they can be vulnerable to ATM fraud. They depend on others because they can’t get around. A “trusted” person may take advantage. The story of a young man interviewed during our study helps illustrate this. He was ill and gave his ATM card to a friend to help him buy medication. He was later “shocked” to discover that his friend had drawn an extra N70,000 (USD $237.50) from his account. Of course, friends and relatives are not to blame for all ATM frauds. Some occur through coercion, particularly physical attacks and armed robbery at ATMs. I wanted to make a withdrawal on a Sunday evening. The ATM on my street was not working so I had to look for another ATM a few streets away. Unfortunately I was robbed by an armed gang. They made me insert my ATM card to confirm the PIN number and balance. They went away with my ATM card and PIN. I couldn’t do anything until Monday, by which time my account had been drained of N200,000 (USD $1,250). They took my phone so I could not even alert the bank and block withdrawals. The success of online fraud depends on offenders choosing easy victims. Reducing ATM fraud depends on making people less vulnerable. For example, anti-fraud education campaigns must use indigenous languages and consider that some bank customers can’t read. Banks must show their customers how their cards work and how to get help when in trouble. Security officers who are not bank staff should not be allowed to deal with customers. ATM users should be taught to change their passwords sometimes. They must also be cautious about when and where they withdraw money to reduce the risk of attacks. This article was originally published on The Conversation by Oludayo Tade, Lecturer of Criminology, Victimology, Deviance and Social Problems, University of Ibadan. Read his recently published article with Oluwatosin Adeniyi in Payments Strategy & Systems, "Automated teller machine fraud in south-west Nigeria: Victim typologies, victimisation strategies and fraud prevention"
Because it can be used anonymously, and is generally thought to be untraceable, cash has long been linked to crime: think of the image of wads of unmarked bills in a suitcase being passed between disreputable conspirators plotting evil. And while it is also commonly thought that cash is one of the primary tools to finance terrorism, recent news on the use of online platforms to fund US terror shows otherwise. Recently, there have been calls to eliminate cash altogether in favor of electronic payments systems, or at least to eliminate high-denomination banknotes. In a new white paper published online this week, however, Ursula Dalinghaus, a postdoctoral scholar at the Institute for Money, Technology & Financial Inclusion (IMTFI) at the University of California, Irvine, demonstrates there is little to no evidence to support the claim that eliminating high-denomination banknotes or restricting cash payments will prevent terrorist attacks. The study finds that targeting cash as a terror financing mechanism misidentifies the problem. In addition, she argues that legal tender – in the form of cash – is a public good that guarantees ease of use, accessibility, a certain level of privacy, and many other unique qualities. Key findings include the importance of the interplay between multiple payment tools and jurisdictions. People use diverse payment methods together, and the movement of value across jurisdictions is subject to different regulatory environments and payment cultures. 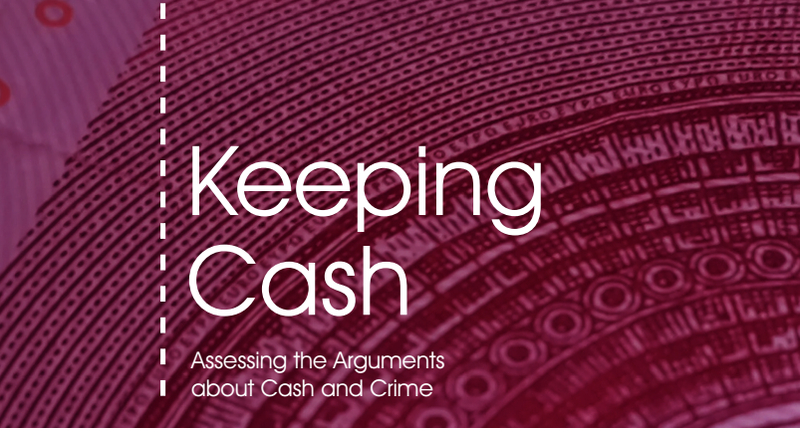 Targeting cash in isolation does not take into account this interplay, and risks displacing criminal activities involving cash to other tools and jurisdictions. Multiple methods of interdiction are therefore needed to address money laundering and terrorist financing. Drawing upon a range of institutional, legal, scholarly, policy, news media and other sources, in collaboration with experts drawn from criminology and terrorist financing, banking, industry, and the social sciences, the report documents how digital forms of payment are also subject to abuse and do not necessarily guarantee transparency in accounting that many believe could aid in the tracking of financial crime. In addition, the shift to digital away from cash exposes people to new risks. Researchers studying the impact of demonetization in India and capital controls in Greece are observing that cash restrictions entail new social and economic burdens and are shifting the costs of making payments onto small businesses and disadvantaged groups in society. Findings from this study have been entered into a EU-wide consultation to be used by the European Commission in Brussels to determine the policy implications of cash restrictions. 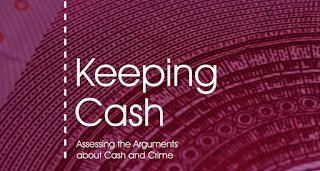 Dalinghaus concludes that there is little to no evidence that limiting cash will effectively target the financing of crime and terrorism. Funding for this paper was supported by the International Currency Association (ICA) and its Cash Matters movement. About the Institute for Money, Technology & Financial Inclusion (IMTFI): Established in 2008 with funding from the Gates Foundation, IMTFI is a research institute based out of the University of California, Irvine. Its core activity has been supporting original research in the developing world on the impact of mobile and digital financial services, focusing on developing grounded, nuanced perspectives on people’s everyday financial practices and the impact of new technologies. To date, IMTFI has supported 147 projects in 47 countries involving 186 different researchers. These researchers have produced 12 books and 100+ articles in scholarly and other venues, and have been mentioned in the media 170+ times, in venues ranging from Bloomberg Businessweek and the Guardian to Forbes, India. 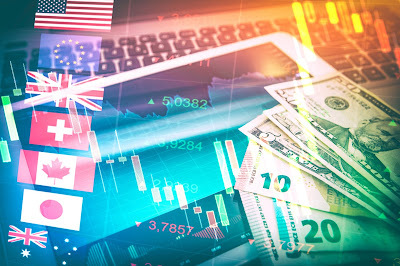 About the International Currency Association (ICA): Founded in 2016 as a not-for-profit organisation, the ICA represents the currency industry across the whole spectrum. It currently has 23 members and 5 associate members; all members are suppliers of currency, or suppliers of products, technologies and equipment used in the design, production, handling and circulation of currency. The ICA is working to ensure that its members drive innovation and offer the best commercial and technical practices to their customers, promote the highest ethical standards, do everything in its members’ power to ensure that cash is secure, efficient and effective and support and promote currencies worldwide as universal and inclusive means of payment. For more on the ICA visit http://www.currencyassociation.org/. Cash Matters, an ICA movement: Cash Matters is a pro-cash movement, funded by the ICA, which supports the existence and relevance of cash as an integral part of the payment landscape now and in future. Cash Matters will support and initiate campaigns on a global level, taking current issues and upcoming legislative changes into account. The Cash Matters website offers authoritative and to accessible facts, figures, and news for consumers, journalists and industry experts alike. For more on the Cash Matters visit www.cashmatters.org. Original post by UCI School of Social Sciences can be accessed here.